« 1960s Travel Case – Adventures Wanted! Just gazing out of the windows of Thrift-ola Towers right now and it's a pretty December-ish day in old London Town. Grey, drizzly, foggy and pretty darn cold. Shall we brighten up the day a little with some bright yellow vintage finds? A ray of vintage sunshine! Horse tin, enamel teapot, daisy tray and cake tin. 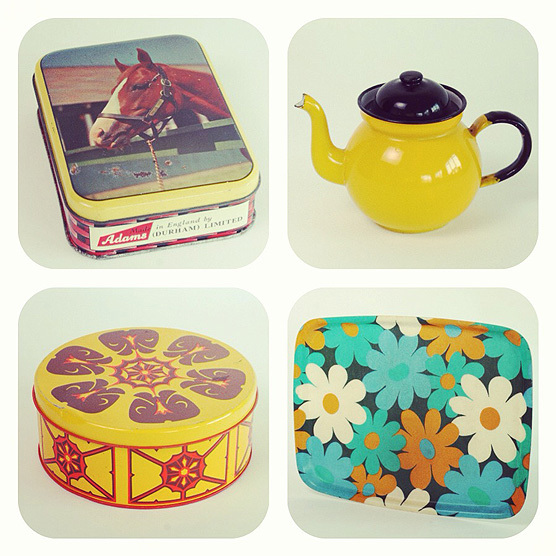 I added this cheerful quartet of colourful vintage finds to my online shoppe yesterday. I think I must be craving summer! The horse tin is a great size for sewing ephemera, particularly buttons, although you could fill it with retro sweets and pop in someone’s stocking! The little bright yellow enamel teapot is an original piece made in Poland in the 70s and will make a tip top cup for one or make a kooky little vase on the kitchen table. The gigantic daisy tray is one of those finds that’s really hard to part with. When it’s not being used to bring you breakfast in bed it’ll display a treat in the kitchen. Last but not least, the colour pop vintage tin is not only a great size for home baked cakes and cookies, it’s absolutely pristine inside so perfect to store food. I hope these brighten up your day a little!